LONDON, England (CNN) -- British man Gary McKinnon appeared in court Tuesday to try to prevent his extradition to the United States, where he is wanted for allegedly hacking into U.S. government computers at the Pentagon and NASA. 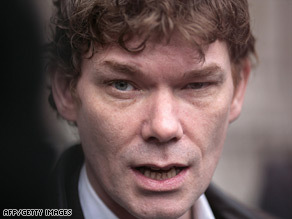 Briton Gary McKinnon is accused of carrying out the biggest ever U.S. military hacking operation. McKinnon, who has admitted breaking the law and intentionally gaining unauthorized access to computer systems, wants to be tried in Britain rather than the United States. He is asking judges at the High Court to review a decision by the director of public prosecutions not to pursue legal action in Britain, a spokeswoman at the prosecutor's office told CNN. The prosecutor's decision effectively cleared the way for McKinnon's extradition, and McKinnon is hoping it will be overturned. It is not clear when the judges will make a decision on McKinnon's request. Prosecutors made their decision in February despite saying there was sufficient evidence to prosecute McKinnon. But they said their evidence did not reflect the level of criminality alleged by U.S. authorities, so they would allow him to be tried in America. The U.S. government says McKinnon carried out the biggest military computer hacking of all time, accessing 97 computers from his home in London for a year starting in March 2001 and costing the government about $1 million. McKinnon, currently free on bail in England, has said he was simply doing research to find out whether the U.S. government was covering up the existence of UFOs. Prosecutors in the United States and Britain disagree. "These were not random experiments in computer hacking, but a deliberate effort to breach U.S. defense systems at a critical time which caused well-documented damage," Alison Saunders of the Crown Prosecution Service said in February. "They may have been conducted from Mr. McKinnon's home computer -- and in that sense there is a UK link -- but the target and the damage were trans-Atlantic." U.S. federal prosecutors accuse McKinnon of breaking into military, NASA and civilian networks and accessing computers at the Pentagon; Fort Benning, Georgia; Fort Meade, Maryland; the Earle Naval Weapons Station in Colts Neck, New Jersey; and the Johnson Space Center in Houston, Texas, among others. In one case, McKinnon allegedly crashed computers belonging to the Military District of Washington. McKinnon is believed to have acted alone, with no known connection to any terrorist organization, said Paul McNulty, the former U.S. attorney for the Eastern District of Virginia. A U.S. federal grand jury indicted McKinnon on seven counts of computer fraud and related activity. If convicted, he would face a maximum of 10 years in prison on each count and a $250,000 fine. McKinnon's lawyer, Karen Todner, has complained that the United States has never provided evidence to prosecutors or McKinnon's legal team to support their extradition request -- and in fact, under Britain's Extradition Act of 2003, U.S. prosecutors are not required to. McKinnon has previously said it was easy for him to access the secret files. "I did occasionally leave messages in system administrators' machines saying, 'This is ridiculous,'" McKinnon has said. "(I left) some political diatribes as well, but also a pointer to say, you know, this is ridiculous." McKinnon was on the brink of extradition in August 2008, when the European Court of Human Rights in Strasbourg, France, refused to reconsider the decision to send him to the United States, effectively clearing the way for his transfer. Shortly after that decision, however, McKinnon was diagnosed with Asperger syndrome, and he claims that diagnosis changed the case for extradition. It was on that basis that McKinnon made his appeals in Britain. Asperger syndrome is a form of autism that affects a person's social communication and interaction, according to Britain's National Autistic Society. Those affected often are of above-average intelligence and have fewer problems speaking than do those with autism. They sometimes have difficulty knowing when to start or end a conversation and can be very literal in what they say, with difficulty understanding jokes, metaphors and sarcasm. In addition, some people with Asperger syndrome develop an intense, sometimes obsessive interest in a hobby or subject, the National Autistic Society said. "He says what he thinks to his own detriment," a friend of McKinnon's told CNN in January. He said McKinnon fears that his compulsion to say what he thinks would land him in trouble in an American prison.